At Advantage Therapy, our treatments are uniquely designed to your needs. Our physical therapist evaluate your walking (gait) pattern to determine where you are compensating for weaknesses or poor muscle coordination. Furthermore, testing on your balance determines where we need to focus our attention on to achieve the greatest results for you. Many of our patients no longer have to use canes or walkers to walk anymore, allowing them a greater freedom of safe movement. Advantage Therapy offers state-of-the-art treatment for balance-related conditions at our clinics in North Springfield, South Springfield, Monett, and Ozark. Additionally our physical therapist in Monett and our physical therapist in North Springfield use expert balance testing utilizing the Biodex SD. We are able to use specific test and scans to identify your deficits and then we will create a treatment program specially for you. Athletes… looking to strengthen your lower extremity and core? Yes, this program can help! At Advantage Therapy, our expert physical therapists have years of training in movement and balance analysis. 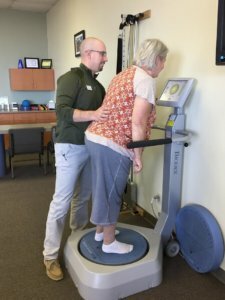 Our physical therapist evaluate your leg strength, movement, balance reflexes and much more to determine exactly where your balance problem lies. We then formulate a complete treatment plan that will improve your balance and train you on what you can do to maintain the improvement. Come in today for a free balance and fall prevention screening with one of our physical therapists or contact us at Springfield, Monett & Ozark, MO Centers!